Access to safe, clean water (left) and safe and hygienic sanitation (right) is a basic human right, which is not always achieved or respected. The Human Right to Water and Sanitation (HRWS) was recognised as a human right by the United Nations General Assembly on 28 July 2010. The HRWS has been recognized in international law through human rights treaties, declarations and other standards. Some commentators have derived the human right to water beyond the General Assembly resolution from Article 11.1 of the International Covenant on Economic, Social and Cultural Rights, making it binding under international law. Other treaties that explicitly recognize the HRWS include the 1979 Convention on the Elimination of All Forms of Discrimination Against Women (CEDAW) and the 1989 Convention on the Rights of the Child (CRC). The first resolutions about the HRWS were passed by the UN General Assembly and the UN Human Rights Council in 2010. They acknowledged that there was a human right to sanitation connected to the human right to water, since the lack of sanitation reduces the quality of water downstream, so subsequent discussions have continued emphasising both rights together. A revised UN resolution in 2015 highlighted that the two rights were separate but equal. The clearest definition of the human right to water was issued by the United Nations Committee on Economic, Social and Cultural Rights in General Comment 15 drafted in 2002. It was a non-binding interpretation that access to water was a condition for the enjoyment of the right to an adequate standard of living, inextricably related to the right to the highest attainable standard of health, and therefore a human right. It stated: "The human right to water entitles everyone to sufficient, safe, acceptable, physically accessible and affordable water for personal and domestic uses." The HRWS obliges governments to ensure that people can enjoy clean, available, acceptable, accessible, and affordable water and sanitation. The ICESCR requires signatory countries to progressively achieve and respect all human rights, including those of water and sanitation. They should work quickly and efficiently to increase access and improve service. All states have ratified either a human rights convention or a political declaration which recognizes the HRWS. The WHO/UNICEF Joint Monitoring Programme for Water Supply and Sanitation reported that 663 million people did not have access to improved sources of drinking water and more than 2.4 billion people lacked access to basic sanitation services in 2015. Access to clean water is a major problem for many parts of the world. Acceptable sources include “household connections, public standpipes, boreholes, protected dug wells, protected springs and rainwater collections”. Although 9 percent of the global population lacks access to water, there are “regions particularly delayed, such as Sub-Saharan Africa.” The UN further emphasizes that “about 1.5 million children under the age of five die each year and 443 million school days are lost because of water- and sanitation-related diseases”. The International Covenant on Economic Social and Cultural Rights (ICESCR) of 1966 codified the economic, social, and cultural rights found within the Universal Declaration on Human Rights (UDHR) of 1948. Neither of these early documents explicitly recognized human rights to water and sanitation. Several later international human rights conventions, however, had provisions that explicitly recognized rights to water and sanitation. The 1979 Convention on the Elimination of All Forms of Discrimination Against Women (CEDAW) has Article 14.2 that states that "parties shall take all appropriate measures to eliminate discrimination against women in rural areas to ensure, on a basis of equality of men and women, that they participate in and benefit from rural development and, in particular shall ensure to women the right:… (h) To enjoy adequate living conditions, particularly in relation to housing, sanitation, electricity and water supply, transport and communications." The 1989 Convention on the Rights of the Child (CRC) has Article 24 that provides that "parties recognize the right of the child to the enjoyment of the highest attainable standard of health and to facilities for the treatment of illness and rehabilitation of health … 2. States parties shall pursue full implementation of this right and, in particular, shall take appropriate measures... (c) To combat disease and malnutrition, including within the framework of primary health care, through, inter alia… the provision of adequate nutritious foods and clean drinking water... ". The 2006 Convention on the Rights of Persons with Disabilities (CRPD) has Article 28(2)(a) that requires that "parties recognize the right of persons with disabilities to social protection and to the enjoyment of that right without discrimination on the basis of disability, and shall take appropriate steps to safeguard and promote the realization of this right, including measures to ensure equal access by persons with disabilities to clean water services, and to ensure access to appropriate and affordable services, devices and other assistance for disability-related needs." Scholars also called attention to the importance of possible UN recognition of human rights to water and sanitation at the end of the twentieth century. Two early efforts to define the human right to water came from law professor Stephen McCaffrey of the University of the Pacific in 1992 and Dr. Peter Gleick in 1999. McCaffrey stated that "Such a right could be envisaged as part and parcel of the right to food or sustenance, the right to health, or most fundamentally, the right to life. Gleick added: "that access to a basic water requirement is a fundamental human right implicitly and explicitly supported by international law, declarations, and State practice." The UN Committee for Economic, Social and Cultural Rights (CESCR) overseeing ICESCR compliance came to similar conclusions as these scholars with General Comment 15 in 2002. It found that a right to water was implicitly part of the right to an adequate standard of living and related to the right to the highest attainable standard of health and the rights to adequate housing and adequate food. It defines that "The human right to water entitles everyone to sufficient, safe, acceptable, physically accessible and affordable water for personal and domestic uses. An adequate amount of safe water is necessary to prevent death from dehydration, to reduce the risk of water-related disease and to provide for consumption, cooking, personal and domestic hygienic requirements." Several countries agreed and formally acknowledged the right to water to be part of their treaty obligations under the ICESCR (e.g., Germany; United Kingdom; Netherlands) after publication of General Comment 15. A further step was taken in 2005 by the former UN Sub-Commission on the Promotion and Protection of Human Rights which issued guidelines to assist governments to achieve and respect the human right to water and sanitation. These guidelines led the UN Human Rights Council to assign Catarina de Albuquerque as an independent expert on the issue of human rights obligations related to access to safe drinking water and sanitation in 2008. She wrote a detailed report in 2009 that outlined human rights obligations to sanitation, and the CESCR responded by stating that sanitation should be recognized by all states. Following intense negotiations, 122 countries formally acknowledged "the Human Right to Water and Sanitation" in General Assembly Resolution 64/292 on 28 July 2010. It recognized the right of every human being to have access to sufficient water for personal and domestic uses (between 50 and 100 liters of water per person per day), which must be safe, acceptable and affordable (water costs should not exceed 3% of household income), and physically accessible (the water source has to be within 1,000 meters of the home and collection time should not exceed 30 minutes)." The General Assembly declared that clean drinking water is "essential to the full enjoyment of life and all other human rights". In September 2010, the UN Human Rights Council adopted a resolution recognizing that the human right to water and sanitation forms part of the right to an adequate standard of living. The mandate of Catarina de Albuquerque as "Independent expert on the issue of human rights obligations related to access to safe drinking water and sanitation" was extended and renamed as "Special Rapporteur on the human right to safe drinking water and sanitation" after the resolutions in 2010. Through her reports to the Human Rights Council and the UN General Assembly, she continued clarifying the scope and content of the human right to water and sanitation. As Special Rapporteur, she addressed issues such as: Human Rights Obligations Related to Non-State Service Provision in Water and Sanitation (2010); Financing for the Realization of the Rights to Water and Sanitation (2011); Wastewater management in the realization of the rights to water and sanitation (2013); and Sustainability and non-retrogression in the realisation of the rights to water and sanitation (2013). Léo Heller was appointed in 2014 to be the second Special Rapporteur on the human rights to safe drinking water and sanitation . Subsequent resolutions extended the mandate of the Special Rapporteur and defined each state's role in the respect of these rights. The most recent General Assembly Resolution 7/169 of 2015 has been called a declaration of "The Human Rights to Safe Drinking Water and Sanitation. It recognized the distinction between the right to water and the right to sanitation. This decision was made due to concern about the right to sanitation being overlooked when compared to the right to water. The right to water has been considered in the Inter-American Court of Human Rights case of the Sawhoyamaxa Indigenous Community v. Paraguay. The issues involved the states failure to acknowledge indigenous communities' property rights over ancestral lands. In 1991, the state removed the indigenous Sawhoyamaxa community from the land resulting in their loss of access to basic essential services, like water, food, schooling and health services. This fell within the scope of the American Convention on Human Rights; encroaching the right to life. Water is included in this right, as part of access to land. The courts required the lands to be returned, compensation provided, and basic goods and services to be implemented, while the community was in the process of having their lands returned. The following cases from the International Centre for Settlement of Investment Disputes (ICSID) concern the contracts established between governments and corporations for the maintenance of waterways. Although the cases regard questions of investment, commentators have noted that the indirect impact of the right to water upon the verdicts is significant. This is as investors were only entitled to compensation inside parameters set out by courts deemed reasonable in their consideration of the public interest, that would indicate recognition of the right to water. About 10% of the worlds water is privatized, It is important to note that the privatization of water is a controversial and heavily disputed issue. The first notable case regarding the right to water in the ICSID is that of Azurix Corp v. Argentina. The dispute was between the Argentine Republic and Azurix Corporation regarding discrepancies arising from a 30-year contract between the parties to operate the water supply of various provinces. A consideration in regard to the right to water is implicitly made during the arbitration for compensation, where it was held that Azurix was entitled to a fair return on the market value of the investment. This was rather than the requested US$438.6 million, citing that a reasonable business person could not expect such a return, given the limits of water price increases and improvements that would be required to ensure a well-functioning, clean water system. Secondly, a similar case encountered by the ICSID is that of Biwater Gauff Ltd v. Tanzania. This was again a case of a private water company in a contractual dispute with a government, this time the United Republic of Tanzania. This contract was for the operation and management of the Dar es Salaam water system. In May 2005, the Tanzania government ended the contract with Biwater Gauff for its alleged failure to meet performance guarantees. in July 2008, the Tribunal issued its decision on the case, declaring that the Tanzania government had violated the agreement with Biwater Gauff. It did not however award monetary damages to Biwater, acknowledging that public interest concerns were paramount in the dispute. Without the existence of an international body that can enforce it, the human right to water relies upon the activity of national courts. The basis for this has been established through the constitutionalisation of economic, social and cultural Rights (ESCR) through one of two means: as "directive principles" that are goals and are often non-justiciable; or as expressly protected and enforceable through the courts. In South Africa, the right to water is enshrined in the constitution and implemented by ordinary statutes. This is evidence of a slight modification of the second technique of constitutionalisation referred to as the "subsidiary legislation model". This means that a large portion of the content and implementation of the right is done an ordinary domestic statute with some constitutional standing. The first notable case in which the courts did so was the Residents of Bon Vista Mansions v. Southern Metropolitan Local Council. The case was brought by residents of a block of flats (Bon Vista Mansions), following the disconnection of the water supply by the local Council, resulting from the failure to pay water charges. The court held that in adherence to the South African Constitution, that constitutionally all persons ought to have access to water as a right. Further reasoning for the decision was based on General Comment 12 on the Right to Food, made by the UN Committee on Economic, Social and Cultural Rights imposing upon parties to the agreement the obligation to observe and respect already existing access to adequate food by not implementing any encroaching measures. The court found that the discontinuation of the existing water source, which had not adhered to the "fair and reasonable" requirements of the South African Water Services Act, was illegal. It is important to note that the decision pre-dates the adoption of the UN General Comment No. 15. The quantity of water to be provided was further discussed in Mazibuko v. City of Johannesburg. The case revolved around the distribution of water through pipes to Phiri, one of the oldest areas of Soweto. This case concerned two major issues: whether or not the city's policy regarding the supply of free basic water, 6 kilolitres per month to each account holder in the city was in conflict with Section 27 of the South African Constitution or Section 11 of the Water Services Act. The second issue being whether or not the installation of pre-paid water meters was lawful. It was held in the High Court that the city's by-laws did not provide for the installation of meters and that their installation was unlawful. Further, as the meters halted supply of water to residence once the free basic water supply had ended, this was deemed an unlawful discontinuation of the water supply. The court held the residents of Phiri should be provided with a free basic water supply of 50 litres per person per day. The work of the Centre for Applied Legal Studies (CALS) of the University of the Witwatersrand in Johannesburg, South Africa and the Pacific Institute in Oakland, California shared a 2008 Business Ethics Network BENNY Award for their work on this case. The Pacific Institute contributed legal testimony based on the work of Dr. Peter Gleick defining a human right to water and quantifying basic human needs for water. The respondents took the case to the Supreme Court of Appeal (SCA) which held that the city's water policy had been formulated based upon a material error of law in regards to the city's obligation to provide the minimum set in the South African National Standard, therefore it was set aside. The court also held the quantity for dignified human existence in compliance with section 27 of the constitution was in fact 42 litres per person per day rather than 50 litres per person per day. The SCA declared that the installation of water meters was illegal, but suspended the order for two years to give the city an opportunity to rectify the situation. The issues went further to the Constitutional Court, which held that the duty created by the constitution required that the state take reasonable legislative and other measures progressively to realise the achievement of the right to access of water, within its available resource. the Constitutional Court also held that it is a matter for the legislature and executive institution of government to act within the allowance of their budgets and that the scrutiny of their programs is a matter of democratic accountability. Therefore, the minimum content set out by the regulation 3(b) is constitutional, rendering the bodies to deviate upwards and further it is inappropriate for a court to determine the achievement of any social and economic right the government has taken steps to implement. The courts had instead focused their inquiry on whether the steps taken by Government are reasonable, and whether the Government subjects its policies to regular review. The judgment has been criticized for deploying an "unnecessarily limiting concept of judicial deference". The two most prominent cases in India regarding the right to water illustrate that although this is not explicitly protected in the Constitution of India; it has been interpreted by the courts that the right to life includes the right to safe and sufficient water. Here a water usage dispute arose due to the fact that the state of Haryana was using the Jamuna River for irrigation, while the residents of Delhi needed it for the purpose of drinking. It was reasoned that domestic use overrode the commercial use of water and the court ruled that Haryana must allow enough water to get to Delhi for consumption and domestic use. Also notable is the case of Subhash Kumar v. State of Bihar, where a discharge of sludge from the washeries into the Bokaro River was petitioned against by way of public interest litigation. The courts found that the right to life, as protected by Article 21 of the Constitution of India, included the right to enjoy pollution-free water. The case failed upon the facts and it was held that the petition had been filed not in any public interest but for the petitioner's personal interest and therefore a continuation of litigation would amount to an abuse of process. ESCR are not explicitly protected in New Zealand at the current time, either by the Human Rights or Bill of Rights Acts, therefore the right to water is not defended by law there. The New Zealand Law Society has recently indicated that this country would give further consideration to the legal status of economic, social and cultural rights. In Pilchen v. City of Auburn, New York, a single mother named Diane Pilchen was living as a rental tenant in a foreclosed house, in which the owner (landlord) of the house had failed to pay the water bill for some time. The City of Auburn billed Pilchen for the landlord's arrears, and repeatedly shut her water service off without notice when she couldn't pay these debts, making the house uninhabitable. The city condemned the home and forced Pilchen and her child to move out. Pilchen was represented by the Public Utility Law Project of New York (PULP) in the lawsuit. The City of Auburn attempted unsuccessfully to argue that water is not a constitutional right because bottled water could be used instead, an argument that was contested by PULP as absurd. In 2010, Pilchen won summary judgment in which it was determined that shutting off the water violated her constitutional rights, and that Pilchen could not be billed and stopped from having water due to an unrelated party's delays in paying water bills. 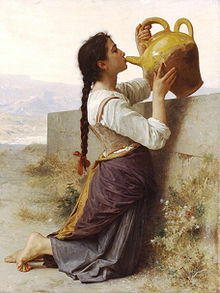 Given the fact that access to water is a cross-border source of concern and potential conflict in the Middle East, the Eastern Mediterranean and parts of North America amongst other places, some non-governmental organizations (NGOs) and scholars argue that the right to water also has a trans-national or extraterritorial aspect. They argue that given the fact that water supplies naturally overlap and cross borders, states also have a legal obligation not to act in a way that might have a negative effect on the enjoyment of human rights in other states. The formal acknowledgement of this legal obligation could prevent the negative effects of the global "water crunch" (as a future threat and one negative result of human over-population). Water shortages and increasing consumption of freshwater make this right incredibly complicated. As the world population rapidly increases, freshwater shortages will cause many problems. A shortage in the quantity of water brings up the question of whether or not water should be transferred from one country to another. The commercialization of water is offered as a response to the increased scarcity of water that has resulted due to the world population tripling while the demand for water has increased six-fold. Market environmentalism uses the markets as a solution to environmental problems such as environmental degradation and an inefficient use of resources. Supporters of market environmentalism believe that the managing of water as an economic good by private companies will be more effective than political accountability by citizens through their representatives. The opponents believe that the consequence of water being a human right excludes private sector involvement and requires that water should be given to all people because it is essential to life. Access to water as a human right is used by some NGOs as a means to combat privatization efforts. A human right to water "generally rests on two justifications: the non-substitutability of drinking water ("essential for life"), and the fact that many other human rights which are explicitly recognized in the UN Conventions are predicated upon an (assumed) availability of water (e.g. the right to food)." ^ "Resolution 64/292: The human right to water and sanitation". United Nations. August 2010. Retrieved 13 October 2018. ^ a b c d de Albuquerque, Catarina (2014). Realising the human rights to water and sanitation: A Handbook by the UN Special Rapporteur (PDF). Portugal: United Nations. pp. "Introduction". ^ a b General Assembly Declares Access to Clean Water and Sanitation Is a Human Right." UN News Center. UN, 28 July 2010. Web. 20 Mar. 2014. ^ a b c Global Issues at the United Nations." UN News Center. UN, n.d. Web. 20 Mar. 2014. ^ The full text of the Convention is available at: http://www.un.org/womenwatch/daw/cedaw/cedaw.htm. ^ The full text of the Convention on the rights of the child is available at: "Archived copy". Archived from the original on 11 June 2010. Retrieved 21 April 2010. CS1 maint: Archived copy as title (link). ^ a b , McCaffrey, S.C. "A Human Right to Water: Domestic and International Implications" (1992) V Georgetown International Environmental Law Review, Issue 1, pp.1-24. ^ a b , Gleick, P.H. "The Human Right to Water" (1999) Water Policy, Vol. 1, Issue 5, pp. 487-503. ^ CESCR, GC 15, 2002, para 2. The full text is available at: http://www.unhchr.ch/tbs/doc.nsf/0/a5458d1d1bbd713fc1256cc400389e94?Opendocument. ^ For more information: http://www.auswaertiges-amt.de/diplo/en/Aussenpolitik/Themen/Menschenrechte/MRVN-Wasser.html. ^ For more information: http://www.irc.nl/page/39765. ^ UN Sub-Commission on the Promotion and Protection of Human Rights, Sub-commission guidelines on the realization of the right to drinking water and sanitation, Report of the Special Rapporteur El Hadji Guissé, UN document E/CN.4/Sub.2/2005/25, 2006, available at: http://www2.ohchr.org/english/issues/water/docs/SUb_Com_Guisse_guidelines.pdf. ^ For more information: http://www2.ohchr.org/english/issues/water/iexpert/overview.htm. ^ a b Sawhoyamaxa Indigenous Community v. Paraguay (Inter-American Court of Human Rights, 29 March 2006). ^ "Archived copy". Archived from the original on 18 June 2013. Retrieved 26 May 2013. CS1 maint: Archived copy as title (link), American Convention on Human Rights, article 4. ^ , International Network for Economic, Social & Cultural RIghts, Case of Sawhoyamaxa Indigenous Community v. Paraguay. ^ , Global Public Interest in International Investment Law, Andreas Kulick, 2012 at 303. ^ , Elliot Curry "Water Scarcity and the Recognition of the Human Right to Safe Freshwater" (2010) 9 Northwestern Journal of International Human Rights 103 at 113. ^ Azurix Corp v. Argentina, ICSID Case No ARB/01/12. ^ , Azurix Corp v Argentina ICSID Case No ARB/01/12 at 149. ^ Biwater Gauff (Tanzania) Ltd v. Tanzania, ICSID Case No ARB/05/22. ^ , Business & Human RIghts Resource Centre, Biwater-Tanzania arbitration. ^ , McGraw, George S. "Defining and Defending the Right to Water and its Minimum Core: Legal Construction and the Role of National Jurisprudence" Loyola University Chicago International Law Review Vol. 8, No. 2, 127-204 (2011) at 137. ^ Residents of Bon Vista Mansions v. Southern Metropolitan Local Council, High Court of South Africa, Case No. 01/12312. ^ , South African Constitution, Section 27(1)(a). ^ , Committee on Economic, Social and Cultural Rights, General Comment 12, Right to adequate food (Twentieth session, 1999), U.N. Doc. E/C.12/1999/5 (1999), reprinted in Compilation of General Comments and General Recommendations Adopted by Human Rights Treaty Bodies, U.N. Doc. HRI/GEN/1/Rev.6 at 62 (2003). ^ McCaffrey, Stephen C. "Human Right to Water: Domestic and International Implications, A." Geo. Int'l Envtl. L. Rev. 5 (1992): 1. ^ Bakker, Karen. "The “Commons” Versus the “Commodity”: Alter‐globalization, Anti‐privatization and the Human Right to Water in the Global South". Antipode 39.3 (2007): 430-455. ^ For more information see: http://www.deza.admin.ch/en/Home/Themes/Water/Access_to_water_An_inalienable_human_right. McCaffrey, S.C. "A Human Right to Water: Domestic and International Implications" (1992) V Georgetown International Environmental Law Review, Issue 1, pp. 1–24. George, Susan; Nhlapo, Mthandeki; Waldorff, Peter (April 2011). "The politics of achieving the Right to Water". Transnational Institute. Terminski, Bogumil. "Selected bibliography on the human right to water", Geneva, 2013.